Battery problems got you down and out? How about a little Jump Start to perk you up again. 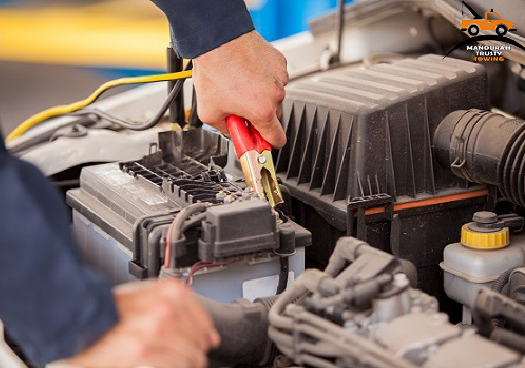 Working like a defibrillator to your vehicle our jump start service will have the battery buzzing. Be blissfully on your way again now your battery has rocketed back into gear and has your engines back to firing on all cylinders. And if the battery has had it? In some instances, your battery may be out for the permanent count. In this case, we can test your battery and if she’s no good replace it then and there. If we are unable to do so, we will simply direct and take you to the nearest auto garage in Mandurah to grab yourself a new one to be up and running again. Accurate Assessment & Rapid Rectification. Mandurah Trust Towing will use both our experienced vehicle knowledge and common sense to assess the situation in order for rectification to be carried out in the best manner. Trust our professional judgement to look after you, so you can be back on the road again in the shortest time possible. Contact the jump start superstars on 08 9468 7220.